Happy Valentine's Day, Nintendo fans! Here's some new titles and apps for the Wii U and 3DS, and even some love for DSiWare and the Wii Virtual Console. Be sure to check it all out on your favorite digital storefront. 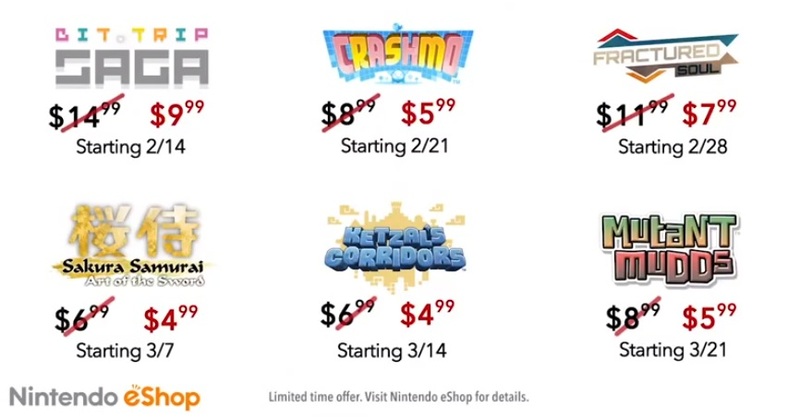 EDIT: Also, the sales coming to the 3DS eShop. The 3DS got a TON of content today! I'll download Wii Street U, I guess. Be sure to fire up your 3DS and check out all of the stuff that's available today, too! Mr. Download Says..."DOMINATE THE GAME!" Yeah, that's all for me too. Maybe Dig Dug at some point down the road, but eh...I've got enough to play at the moment. No need to spend more. @GameDadGrant Oh yeah, I'll have to grab Bit.Trip Saga before the sale ends. $15 was already a steal for that game, $10 is ridiculously good. As for the rest of it, there's a lot of videos (meh), Fire Emblem DLC (I don't have Fire Emblem), and some games that don't interest me. Okay, Dinosaur Office isn't meh. Added the sales. Thanks anon_mastermind! Apparently Inti Creates is the developer behind this Naruto game. I'll try anything from the guys who gave us Mega Man 9. I'll be visiting the eShop today but not for any of the new releases. Bit Trip Saga for a tenner is a no-brainer, and I want to view the DKCR3D video. Runner 2 looked great in the Nintendo Direct, I'll have to grab it this month. Bit.Trip Saga at that price is an absolute steal. I got it for $15 a couple of months ago and have no regrets. I also want to see what DKCR3D looks like...as for the rest of the 3DS offerings, not today. Probably not ever. I'm tempted to spend $10 on Bit.Trip Saga since it's such an amazing deal, but I doubt I'd play it much. I'd still rather play the WiiWare versions, especially for Beat and Flux with their (I'm assuming) superior motion controls. Are there any extra features like the challenges from the Wii collection or online leaderboards? No, make no mistake about it: Bit.Trip Beat and Bit.Trip Flux control much better with the stylus. I reviewed the 3DS version a while ago. It's free on PlayStation + so I downloaded it to my Vita, it's kind of neat for like 10 minutes but it's really not that much fun, honestly you're not missing much. It's great that all these games are on sale but I already own them all except Fractured Soul, and do not want. You don't have Fire Emblem?!? Well, that makes it totally clear what you should be downloading from the eShop! Immediately! NES Dig Dug? Is that Dig Dug II then? I don't think Dig Dug (1) is on NES. Weird! @Mr_Mustache You're half right. It was released only in Japan. Is this one of the .30 cent ones? I will bite on several of those sales. Have you guys played Dig Dug DS? I think that I 100%'d it, for some reason.